Click here to start a personalized tour of your local radio station! We have finally reached the end of our radio journey. We've laughed, we've cried. We have made friendship bonds that none can sever. This moment is ours. Let us take it. The media landscape changes quickly these days, but luckily, you and I will always have this little bit of radio history to bond us together. Thanks for coming along on the ride. Right-click on the pic to save it, then fill in the blank however you want. Print it, then use pencils, crayons, etc. and scan it (or take a really good picture of it) and send it back. Or if you got tha skillz, use your computer to make us all a nice picture to see! Make it suitable for sharing, and send it to me below. I'll post them as I receive them! This looks like an AM radio, dreaming about programming. Sports, Religious Services, Trumpets & Bowties, and a Woman Offering a Man a Lollipop (after he has asked for "just one") are all more common on AM (Amplitude Modulation) than they are on FM (Frequency Modulation), but that landscape is changing. There's a chance that the picture is not actually depicting "sports", but "news", as it looks like that kid is gonna get beaned by that ball. That might be a local news story. I am not very athletic. Any activity that involves throwing or catching a ball, running, sweating, or trying hard is not something at which I excel. But even I know that you gotta use the mitt to catch a baseball, not your face, which is what that kid is about to do. 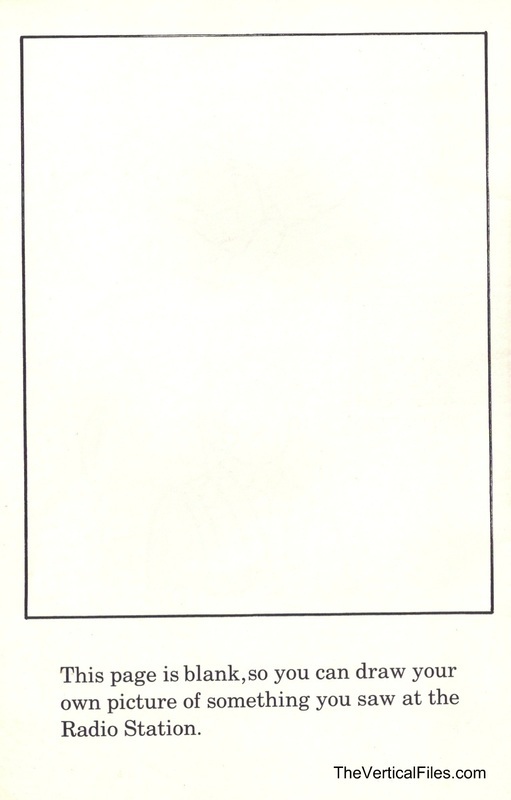 This is the last informational page in the book. I think it's telling that the Sales Manager was covered in the book before Programming. 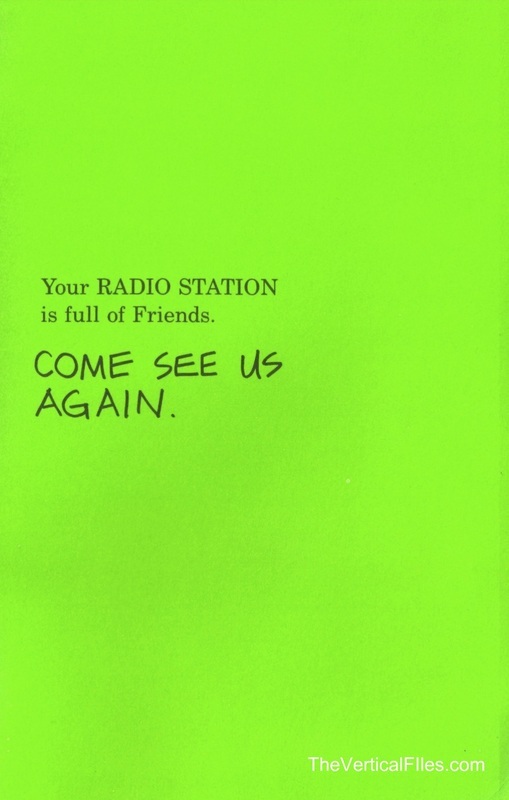 That's radio in a nutshell. My advice to people who want to get into radio to be rich and famous is this: Don't, unless you really understand what you're in for. The big money is in Sales & Management, unless you host a successful morning or afternoon show (and even that's no guarantee). I first started in 1990, and the time of the Powerful DJ Who Picks the Hits, was already over by then (if it ever really existed). 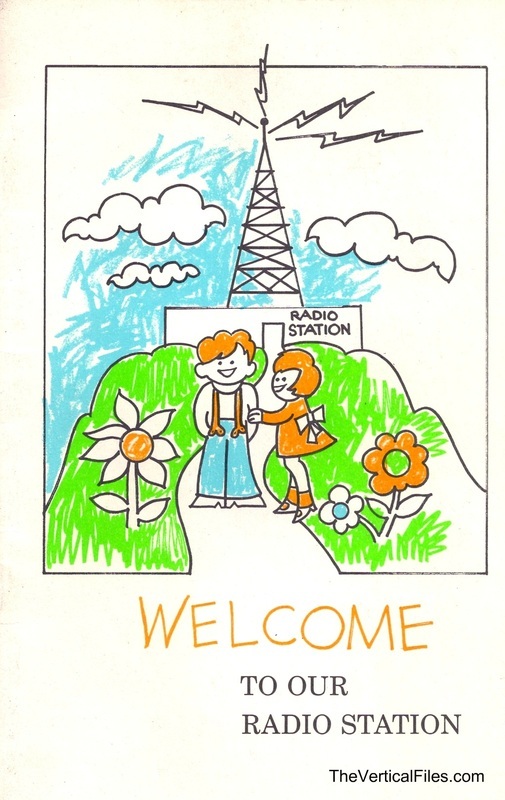 If you're getting into radio because you love music: Don't, unless you are lucky enough to find a little station that will let you pick some of your own tunes. If you find that station, it will be a small one. Your friends won't be able to hear the station because the signal only reaches the parking lot, so you will direct them to listen to your show on the internet. So just start your own radio station on the web. Cut out the middleman. Be your own boss. Make a show that radio would want to buy, and then sell it to them. If it worked for this fictional teenager, it can work for you! As I mentioned on the very first page, I'm not bitter about not being on the radio, just being realistic. This is how the business works, and it has been this way for a long time. There's not too much to make fun of here. This is really how it works (basically). Although, I must say that the bicycles don't really look that well-made. I certainly wouldn't buy one of those for my kid, which is probably why the bike store needs to advertise their presence in the first place. And the factory looks pretty small compared to the large, misshapen wheels it has stored outside. I'd say that was the Wheel Trash Heap, but they seem to end up on the bikes before they get sold. 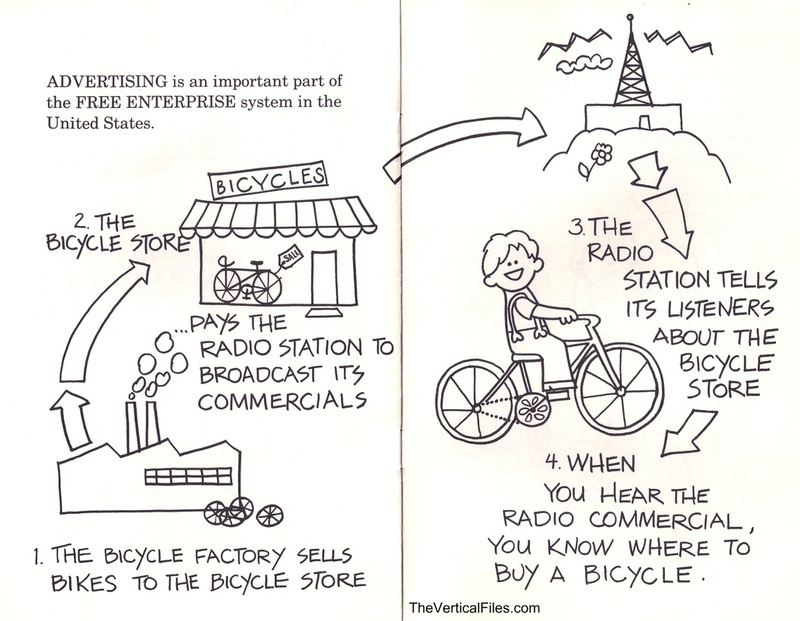 Also, this diagram leaves out the detail that the only reason the radio station itself exists is to sell bikes. The people who work there want to bring entertainment to the masses, but the radio actually only exists to sell you things. So buy things, ok? This is Reggie Moneybucks, the SALES MANAGER. This man is the true heart of the radio station. See how that schedule is completely blank? It's Reggie's job to make sure that everyone who works for him figures out ways to fill that schedule. It is the Most Important Job At The Radio Station. Reggie's contract demands that he receive a new boutonniere in his lapel every day at 9am and again at noon. This is a small expense compared to the kabillions of dollars that Reggie single-handedly brings to the station. Reggie allows music to occasionally be heard on certain stations because he is sentimental for the "old days" of radio. Don't go anywhere, because at the end of the Sales Meeting, Reggie will pour a pitcher of milk into a rolled-up newspaper for his closing act. He's been practicing all weekend. The woman who is allowed to drive (or the hippie) from Page 1 has returned, and is doing a News Report on the behind-the-scenes staff at a radio station. These are all fireable people. In fact, since this book was published, everyone in this picture has been replaced by a single smart phone. You see, in the 80's, there was a need for a guy who holds nun-chucks by the chain, a lip-synching background singer and a lady holding a primitive iPad called a "notebook". But now, there's an app for all that. When new management recently took over the last radio station where I worked, they held up a smart phone at a meeting (I was there) and basically said "we can access any part of any radio station we own from anywhere with one of these". That really happened. The news woman who is allowed to drive (or the hippie) was replaced by Google, shortly after filing this news report. Page 8: To the Transmitter! So we now we get down to the real nitty-gritty. 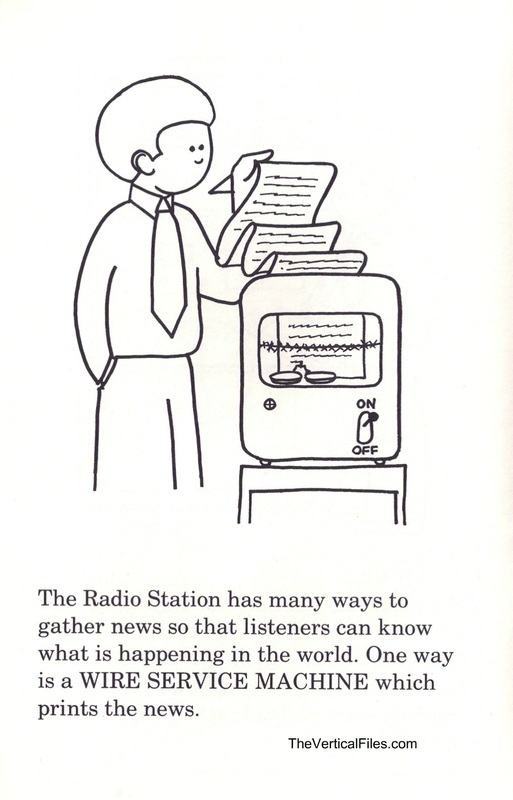 Here's how radio really works. The engineer listens to music on one side of a hill, writing down and keeping track of any sections of music that are too fast. 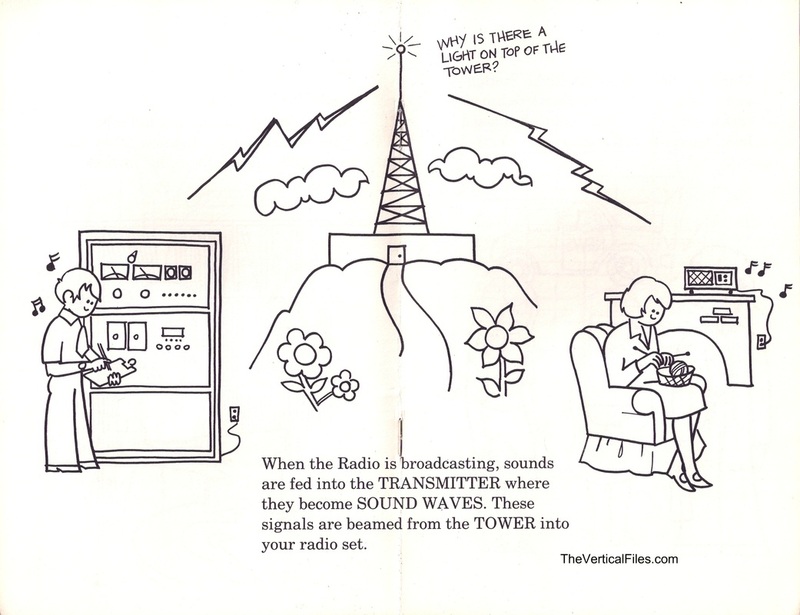 The radio machine then sends the signal via lightning bolt to a tower, which then broadcasts the message: "Why is there a light on top of the tower?" (again, via lightning bolt) to anyone on the other side of the hill. Notice that our knitting lady from Page 2 is now alone. She is the only member of the family who cares enough about the question being broadcast to await an answer. Radio demands loyalty, and Knitting Lady will be well-rewarded in time. The sad thing about this picture is that this nice lady was fired soon after this photo was taken. Turns out she was only keeping the pretty record covers and throwing out what she considered to be the ugly round pieces of plastic inside. Don't be sad for her, though. She successfully sued for wrongful termination when she proved that she was actually laid off due to her creepy lobster hands creeping out her boss. 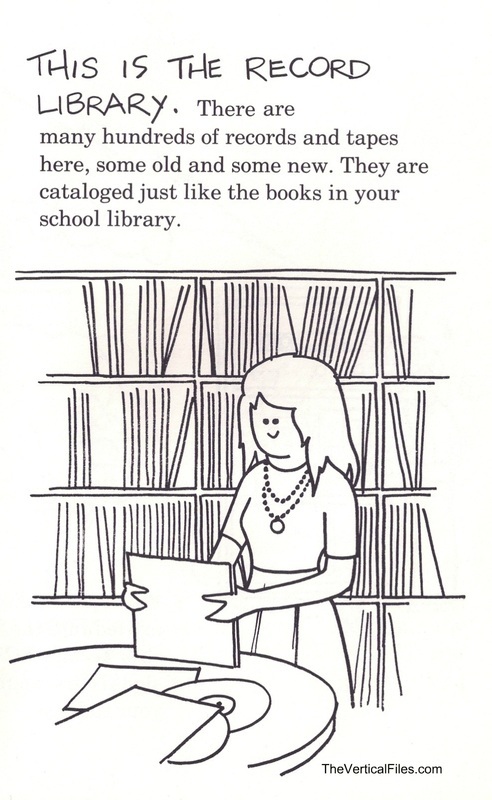 This library is EXACTLY like your school library in that records that mention science, real American history, or breasts are immediately banned without question. As most people know, the Wire Service Machine is so simple, it can be operated with just one hand on Casual Friday. What most don't know, is that it prints out the news onto paper using one small section of barbed wire and a pair of tanning booth eye protectors. Technology rules! 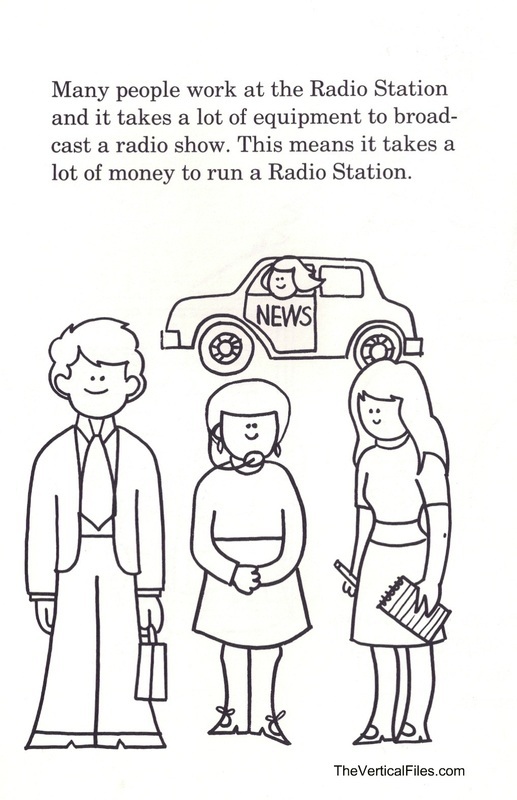 The other "many ways" that a radio station can gather news is totally a secret. Sorry! 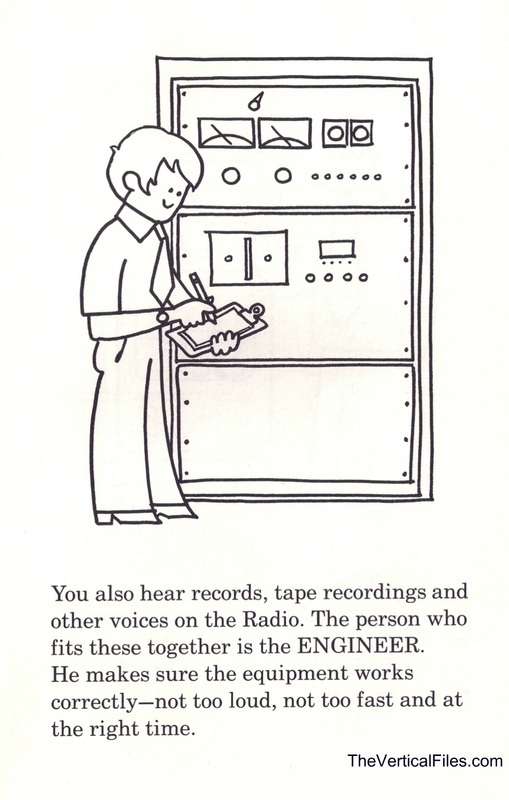 Before engineers came on the scene, the number one complaint about radio was that it was "too fast". 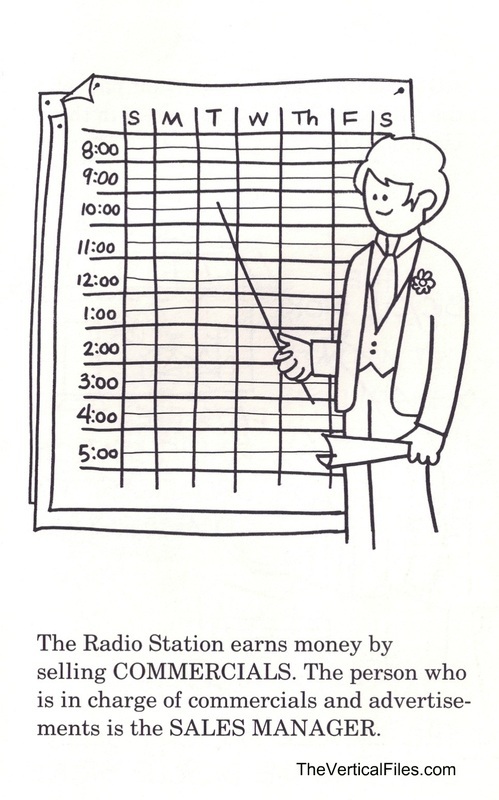 Thanks to the invention of engineers (in 1982), radio is constantly set at the correct speed. If you ever hear anything on the radio that is too fast, call an engineer. He will then check his FCC Brand Clipboard to be certain he is following regulations, and making sure the "other voices" are at the same speed as the "regular voices". 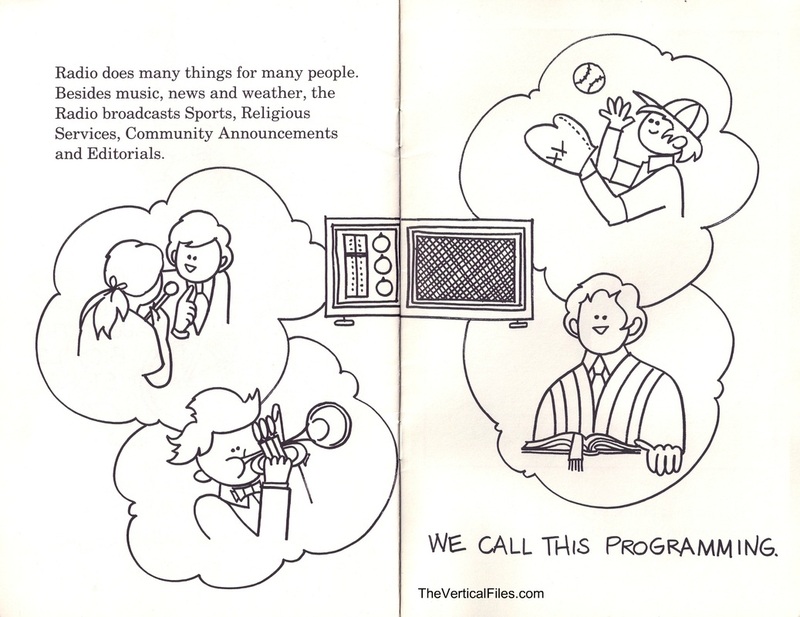 On this blog, I'll go page by page in this coloring book, comparing 1983's idea of radio to today's. It's actually quite similar, save a few minor differences.